Premiering at this year's Revelation Perth International Film Festival, the thrilling Watch the Sunset is the first Australian feature film to have been shot entirely in one take. Directed by Tristan Barr and Michael Gosden, Watch the Sunset is a film that follows a young man, Danny (also played by Barr), who is trying to make a fresh start for he and his family away from the life of crime he was once part of. The film is a brutal study of the underlying effects of Crystal Meth or Ice, but at the same time is a love story about how far you will go for family. Watch the Sunset is superbly shot in one take and is done so with incredible directorial skill and stunning cinematography. The haunting musical score accompanying the film is completely unnerving, but it is the convincing performances by each member of the cast that make Watch the Sunset a confronting, but incredibly rewarding cinematic experience. 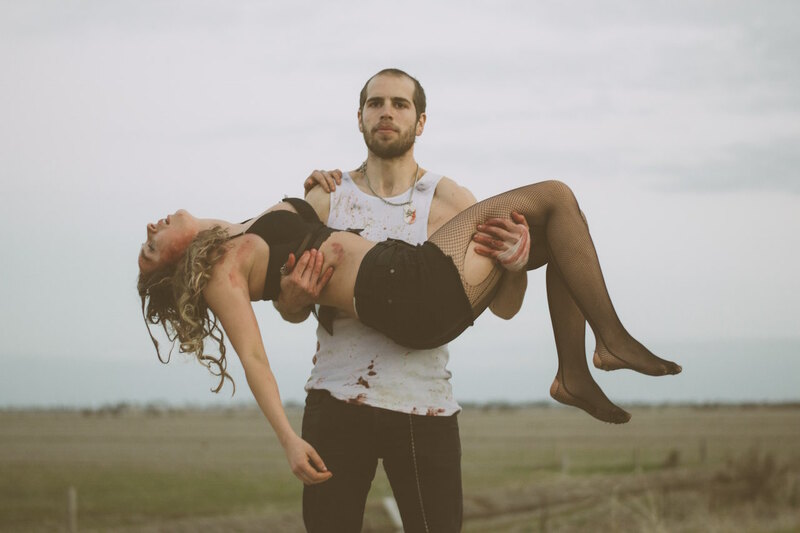 On the eve of Watch the Sunset's World Premiere at the Revelation Perth International Film Festival, we spoke to Tristan Barr about his experience making the one-shot film and how it compares to traditional filmmaking. Firstly, congratulations on being part of the Revelation Perth International Film Festival! You must be very proud and excited! Thank you! We are happy to start getting it out there. Watch the Sunset is primarily about the violent effect of Ice/Crystal Meth and how it is becoming a bigger and bigger problem in today's society. What made you decide that you wanted to make a film about this terrifying social problem? The story was based on true events and the characters on real people whom I have personal experience with which stirred me to write the concept. So the biggest appeal or motivation was bringing light to their story that is a very raw reality in regional Australia. It's actually a love story at heart. Heaps of research, interviews, reviewing of court cases.... Sometimes tedious work, but once we uncovered some stuff, we just knew it had to feature. Some stories are unbelievable! If you made films about some of the stories we came across an audience just wouldn't believe them. I couldn't sleep for a period in pre-production. If you don't mind me saying, Watch The Sunset is truly incredible. It's unlike any other one-shot film as it takes place across a whole town without editing. What was the pre-production like? How much rehearsal was needed in preparation for the day of filming? 2-3 months of rehearsal. The town was incredible! Kerang (regional Victoria) was incredibly supportive and some of the best darn country folk in Australia. We were actually overwhelmed with the assistance we received and it was up to our production manager, Ally Bjørnstad to set over 80 locals in position every day who volunteered their time for the shoot. I’m so grateful to the community and patience they had with us. The film moves from one side of the town to the other and stops at about nine locations, so we are just glad we were able to utilise the whole of the town with their support. I was just hoping it would all come together, and thank God it did. I didn't want to let down all who had helped us. As it is filmed across a whole town, there must have been so much so much planning to keep everything running to plan. Was there anything that went wrong while filming that you had no control over? There was plenty that went wrong that you'll never know of (laughs). Maybe we'll release some Behind The Scenes. One time a police car pulled us over in rehearsals. That would of made for an interesting addition in the actual film. What was the hardest part of making a one-shot film? Logistics. Timing. And having to compromise. Sometimes there was better cinematography in some takes and sometimes there was better performance. Choosing the take was very difficult. Tristan, you also star in the film as Danny, who is the lead. Was it difficult directing and acting in the film? I didn’t see myself in the role originally when I first wrote the concept. But with the constraints we had and the way in which we were collaborating and improvising for the scripting, we (with co-director Michael Gosden) quickly made the decision we would act in it too. That decision led to us taking more responsibility over the characters and their story arcs. So it was hard to take on both of those roles. However it was sort of built into the process. Once the camera was rolling there was no real room for a director anyway, so the cast and crew were just trusting the preparation. What did you find were the major differences between directing a one-shot film and one in which you allow scene cuts? The need for accuracy and planning of course, but adrenaline was the major difference. It was like we were playing a grand final everyday (laughs) Luckily we had seven attempts at the grand final. What plans are there for Watch The Sunset beyond the film festival? We are playing at the Brisbane International Film Festival and have some interest in Sydney & Melbourne as well as a big international launch.